Inflatable paddleboarding is a relatively new and increasingly popular leisure activity. Offering a great full body workout or simply just a relaxing trip around the lake, inflatable stand up paddleboarding (iSUP) offers something for everyone. Although this is a relatively new paddle activity, it has quite a bit of terminology to consider before choosing the right board for you. To help, we have scoured the web and compiled a list of our favorite inflatable sup boards on the market. iSUPs typically are around 10 feet long, that’s why we have chosen to highlight the best inflatable paddle board. The best inflatable SUP will still be very durable and carry a high buoyancy while still getting small enough to fit inside of a backpack. 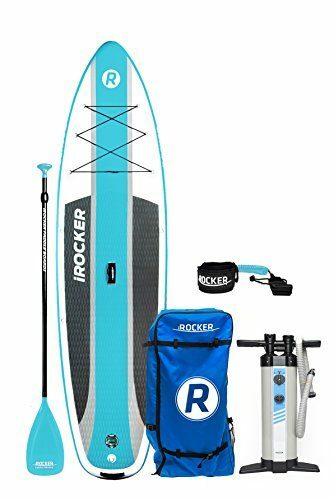 iRocker has years of experience in developing one of the best inflatable stand up paddle boards. 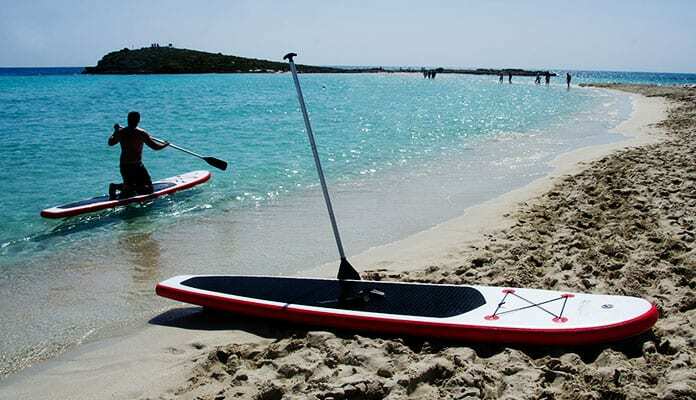 We love that this company is so sure of the quality of this best inflatable paddle board it is even willing to add a two-year manufacturer’s warranty. Being made of military-grade PVC means that this is a very durable iSUP. Don’t worry about scuffs or dings as this material can handle normal wear and tear. iRocker even boasts its durability to be so strong it can withstand being run over by a car. We love this inflatable sup board for its unparallel buoyancy being the highest weight capacity on our list. Perfect for extra cargo, a pup or even a friend. 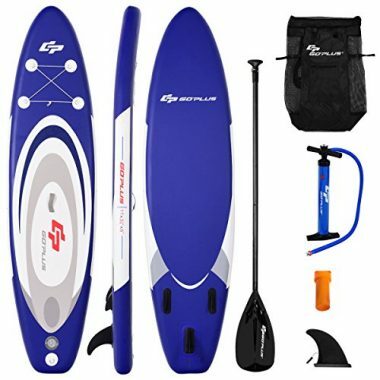 Being the best inflatable sup board that is one of the larger boards means that this is a good choice for people just starting out in the sport. The tri fin system will allow this board to point where you want it to. Easy to inflate, the included pump will inflate the board in under five minutes. Being lightweight allows it to be carried with ease. Its thick stance allows you to ride high above the water which means you can ride in any water conditions or ride with clothes and not get wet. The package includes a paddle and pump which gets you quickly in the water. The pump includes a gauge so you know exactly how rigid the board will be. It can be pumped to 15 PSI, but is rideable past 10 PSI. Weight limit: 400 lbs. This board can hold a lot of weight! A lot of inflatable SUPs will have lower weight limits. Materials: This isup board is made out of military-grade PVC with drop-stitch construction. Don’t think that this paddle board is wimpy just because it’s inflatable — unlike hard standup paddle boards, it’s not susceptible to dents and cracks. Impressive! 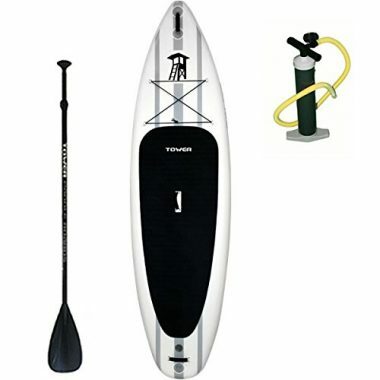 This is the best inflatable stand up paddle board that is made of heavy-duty PVC, and when it is inflated, it is known as a hard board mimicker. You could inflate this board and place it elevated with a chair supporting the board at each end, and you would be able to stand on the board without it collapsing. You get a lot of the benefits of a regular paddleboard while still being able to take this board anywhere with you, and pack it up nice and small. Compared to previous models, this one is a lot lighter. The included pump will help you to inflate the board to 15 PSI, giving you great control and speed through the water. We love the classic green of the board, and the buffalo decal on the top and the bottom. The board comes with a three-piece paddle with nylon blade. The handy backpack allows you to deflate this board and take it anywhere with you. 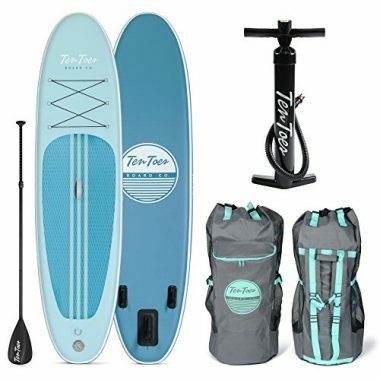 You can pack your board and all your accessories and take this paddleboard places where you could not take a regular paddleboard. It is also great for storing your board when you are done using it for the season. 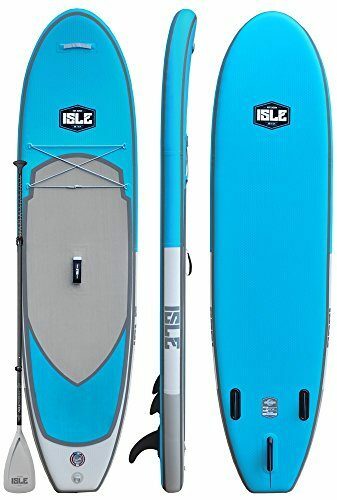 This is the best inflatable sup for the money made by Isle Surf which is a company that was founded by two San Diego surfers who had a passion for paddleboarding and surfing. Since 2004 they have used their experience to develop top quality inflatable paddle boards. Their love for nature and water have guided their company’s philosophy and research. Like others on this list the PEAK Inflatable Stand Up Paddle Board is made of military grade PVC. The non slip grip is great for keeping you secure and allows you to bring your dogs with you for an extended trip. You will always stand out as this inflatable sup comes in four different colors. The PEAK Inflatable stand up paddle board is a well rounded board. It has a high rider weight limit, 300 pounds, and is lightweight, only 18 pounds. Inflated to its full 15 PSI this board sits 6 inches high and rides like a rigid foam board. This makes you feel stable even in choppy waters. A bungee system makes it easy to carry items with you. Pack a lunch and a sleeping bag for a trip to an island. Bring a friend along with the inflatable sup high weight capacity. The package PEAK has put together includes everything you need to get started. The pump fills the iSUP with ease, the three piece paddle is adjustable and folds up small, and the leash keeps your board in arms reach when you fall. We like that a repair kit is included as well. 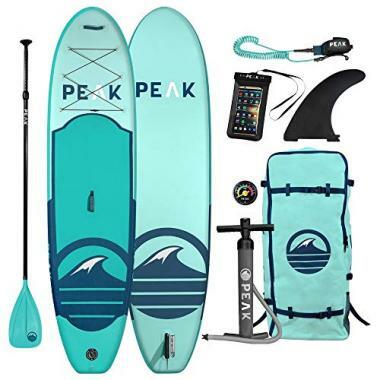 PEAK has created an inflatable paddle board and package that you will be happy with for years to come. This is one of the top paddle boards on the market. Material: Military-grade PVC. This is one of the main selling points of the Tower Adventurer isup boards. They’re super-duper durable. The extra width on this inflatable paddleboard means that you get extra stability in the water. The board is great for touring, but also great for other activities such as fishing for your paddleboard or paddleboard yoga. The 5 inches of thickness also help to make this board strong and rigid, much more so than the 4-inch thick boards. Pathfinder is so confident in this board that they have even run over it with a car when fully inflated to show exactly how tough it actually is. The board stood up to it, by the way. The diamond-grooved deck pad gives you great grip whether you are standing or kneeling on your board. The center fin is removable, and when you do deflate your board, you can roll it up extremely small and use the carry strap to carry your board without having to pack it in a bag. The extra buoyancy of the board helps the board to float higher in the water. This means that the board can accommodate a lot of weight without the board sagging or dipping down into the water. This is a great all round board for novices and advanced riders. You can load up the board with all of your belongings and spend a lot of time out on the water. 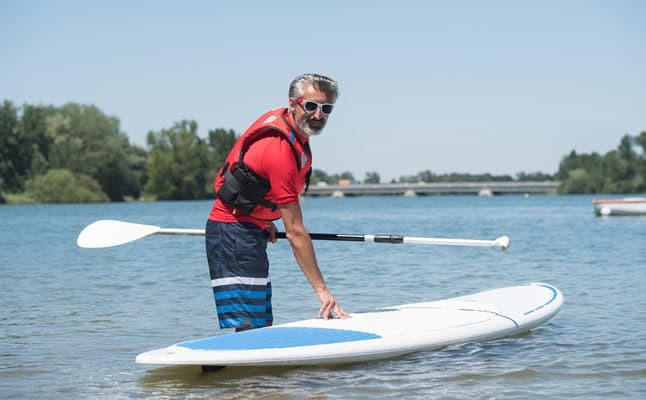 This inflatable paddle board is great for anyone who wants to get into and out of the water quickly, with a minimum of fuss, and a focus on fun. The board is more compact than others on the list, meaning that you can store it in the smallest of places, and you do not have to worry about the board taking up space in your car. 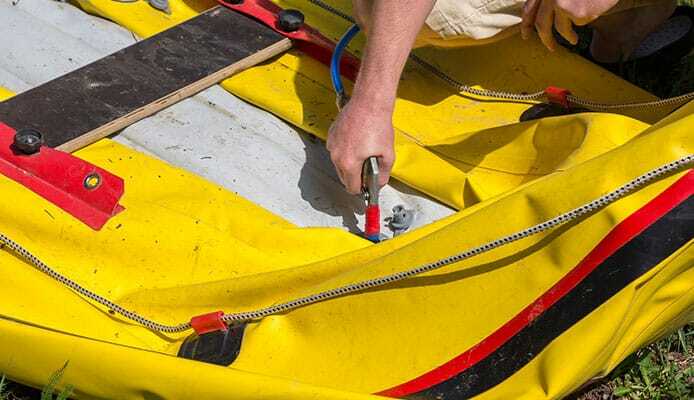 When you get to the water, the lower volume will allow you to inflate the board quickly and easily, and when you are on the water, you will notice that this board handles extremely well. What you will also notice is that the board is not flimsy or cheap. The board may be smaller than others, but that does not mean it is less rigid or not as strong. The board will support your weight and your belongings when you are out on the water. This is the perfectly named board. The weekender is just for that. A great board for getting away from it all on the weekends. Throw it in the car, get to the water, inflate it, have fun, deflate it, and throw it back in the car again. Simple and easy. This is one of the smallest boards on our list. This is not a board for the absolute beginner. The board does not have the same stability as some of the other boards on our list, but this is a choice, not a compromise. The smaller profile in the water makes this a board which you can get moving fast and one which you can turn quickly. This may not be the quickest board in the world when you reach top speed, but if you are entering races where there are a lot of turns, then this board will give you a chance. The board is simple in design and elegant in construction. The aluminum oar is heavy-duty, and you can paddle furiously to get your acceleration without having to worry about the paddle bending or flexing. This allows you to generate more power than some of the adjustable and collapsible fins. This is the next step up for someone who has experience with paddleboarding, or for someone who wants to dive in at the deep end. If you are going to dive in at the deep end, then make sure that you have a wetsuit on. There is a reason Tower is featured on our list twice – it makes excellent paddle boards. The Adventurer 2 is no exception. It is a full size isup board coming in at just under ten and a half feet. This is an inflatable paddle board that is designed with military grade PVC which means it is exceptionally durable. Tower claims that even fully inflated a car can drive over it without popping it, something we don’t recommend trying. It’s supreme build is due to it’s drop stitch seam. This allows it to hold air for the life of the iSUP board. Being so rigid makes it ride like a solid inflatable paddle board. This means it cuts through waves and rough water with ease. Just to prove how confident they are, Tower includes a two year warranty on their board and other accessories. Being inflatable has its benefits. Coming with a pump, this paddle board inflates with ease. When you’re done your day just deflate and roll out the air. The small package allows you to easily store and transport this iSUP. Folding it allows you to put it in a bag and hang it in your garage. Don’t worry about buying roof racks for your vehicle as it easily fits into the trunk of your car. 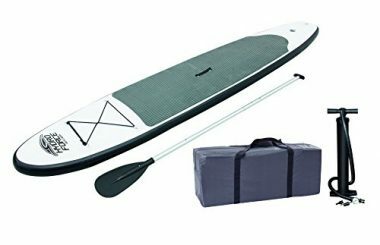 This sup board comes in a package that saves you money because it includes a paddle, pump, and even a carry strap. The price is not an indication of the quality of the sup board. For the surprisingly low price of $550 you are getting everything you need to jump in the water. 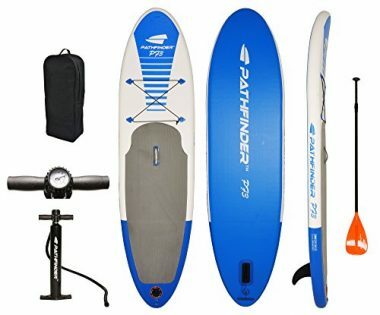 The Tower Adventurer 2 is comparable to paddle boards that are nearly double this price. Material: Military-grade PVC. This is one of the main selling points of the Tower Adventurer boards. They’re super-duper durable. Solstice Sports is a paddleboard and kiteboarding company from Colorado. Their paddleboard lineup is impressive, specializing mainly in racing paddle boards. The Bali is more of a cruising board that has an impressive design. Like the other inflatable sup boards on the list the Bali is constructed using PVC. The durable 1000 Denier 3 ply PVC ensured this paddle board will stand the test of time as it is the same material Zodiac boats are made of. You won’t have to worry about losing air or bending over waves as this paddle board feels very rigid in the water. This is also the heaviest inflatable paddle board on the list coming in at almost forty pounds. This could make it difficult for some people to maneuver into the water. But with that being said this is a solid iSUP board for any skill level. It rides firm and stays stable in the water. The non slip pad will ensure your feet stay planted even in moderate waves. The large single fin tracks well and keeps you on the path you want. The Solstice Bali paddleboard comes in a very well rounded package including a pump, fin, backpack. We were disappointed to see it doesn’t come with a paddle but a small price to pay for an affordable quality best inflatable sup board. The backpack is made of a durable mesh material with a rubber base that fits the inflatable board easily making it an all around high quality buy. Being around since 2004 has given this company time to figure out what works and what doesn’t. An impressive amount of time and research has gone into making this inflatable paddle board. ISLE is so confident that you will like this isup board it includes a 30 day money back guarantee and one year warranty. Being made of military grade PVC ensures you don’t have to worry about losing air or the board flexing. It is the lightest best inflatable sup board on our list making it the easiest to carry and maneuver into the water. Keep in mind that one trade off with being so lightweight is the lower weight capacity at 240 pounds. The ISLE Airtech paddle board is designed for a comfortable ride. Once it is inflated it sits at six inches thick which allows it to glide over the wake with ease. This makes it a good isup board no matter what your skill level. Beginners will like the stable body and the no slip pad while more advanced riders will enjoy its sleek look and high quality design. This package includes everything you need to jump into action. The three piece paddle is strong and durable while the pump has a readable gauge that tells you when your iSUP is inflated. As a bonus the backpack has enough pockets for snacks and a music player. There is a lot of space on this board, and the board can carry a lot of weight, which makes it great for carrying more than one person. A couple can go out on this board and enjoy the serenity of the water, or you can take your child out on the water with you. The triple-fin system gives the board more stability when it is on the water, and also makes it easier to control. A great board for taking someone out to learn how to paddleboard. We love how easy it is to inflate this paddleboard. It only takes six minutes to get the board from the bag to the water. If you do have a child with you, they will not get bored by the setup as they will hardly have time to think about it. When you are out on the water, the anti-slip deck will help to keep your feet in position, and you on the board. This is a great board for you to work on your core without realizing it, and for kids tower on their balance and strength while still having fun. 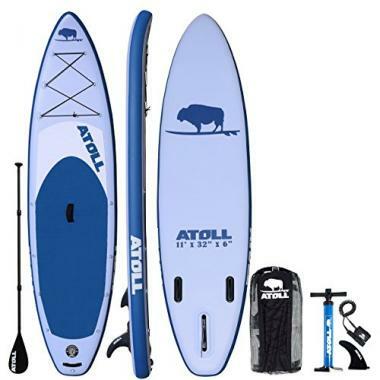 A great entry-level board for all levels of paddleboarder. When comparing a similarly sized inflatable paddleboard to a fiberglass board you will be hard pressed to see any difference. You may find that a rigid board goes ever so slightly faster and is slightly easier to paddle, but unless you were riding one after the other you wouldn’t be able to tell a difference. Even the carrying capacity and rigidity were similar between the two. The rigid board was obviously stiffer, but the inflatable is still more than capable of carrying coolers and extra gear. Length: It’s no secret that a longer board will be able to go faster but be more cumbersome to turn. This is why people new to the sport go with a shorter board while people who’ve been paddleboarding for years choose a longer option. Width: A more narrow board will also be faster but less stable. Wider boards offer more stability but are slower. Thickness: A thicker board is better in our opinion. It will not only be able to hold more but also make you ride higher in the water. This will give you the option of paddling in socks or even shoes without getting your feet wet. Rocker: This describes the curve of the nose of your board. You will want more of a rocker when paddling in places with large waves. Portability: Inflatable paddleboards are much more easily transported and stored than rigid boards. They can even be thrown in the trunk of your car and forget about it until you want it. Durability: A lot of companies are turning to military grade PVC for the construction of these boards. This material has been specially designed to be nearly bulletproof while still being able to be folded neatly. Storage: Inflatable paddleboards are some of the easiest water sport items to store. You don’t need a big yard or garage, instead, a small closet will be enough room. 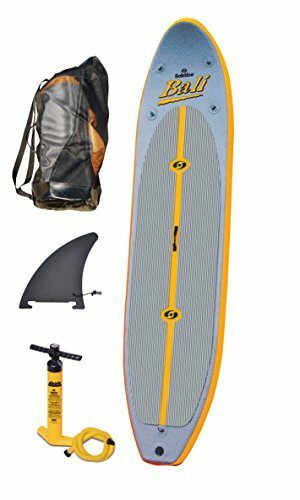 Cost: You can find amazing deals for these boards starting at around $500 which includes everything you need to get on the water. User Friendly: Learning on an inflatable is much easier, and less painful, than on a rigid board. Your kids will love that they can play on it without hurting every time they fall. Setup: It’s no surprise this is on our list. Instead of taking a rigid board off your car you have to spend the time to pump your board up. Surfing: Inflatable paddleboards aren’t the best for surfing with. You can manage but if you’re used to a typical surfboard you may be disappointed. There are a few different features that you will want to look for in a paddle board and we have listed them below. This is important for paddlers to consider, especially those in the beginner or intermediate skill level. Paddle boarding is quite an easy sport to learn but due to the high center of gravity, it is desirable to have a board that excels in stability. While many people think that the length of a board determines its stability, this isn’t completely true. While this does play a role, the thickness of your board plays a bigger role. Most often, a board around thicker than 4 inches is preferred. A higher rocker plays the biggest role in determining how well the board cuts the water and therefore how easy your SUP is to paddle. Inflatable SUPs are often harder to paddle that solid boards for this reason. Owning a paddle board is only enjoyable if you can actually get it into the water. For those that don’t have a vehicle to transport their SUP, opting for an inflatable board is a good idea. These are also ideal for storing as paddle boards often sit around 9 feet long. While they don’t perform quite as well in the water, their benefits often far outweigh their cons. Typically, inflating your paddle board should take between 3-5 minutes depending on the size and how quickly you work. You should be inflating your board to a PSI level between 12-15. Oftentimes you will find that the gauge provided is relatively inaccurate. Rest assured that you cannot over inflate these boards. When in doubt just keep pumping until you are certain it is enough. Paddle boards are decreasing in price as more competitors enter the market. You should be able to get a board between $350 – $800 depending on quality. Typically speaking you get what you pay for in the SUP world. More expensive boards will incorporate a higher quality plastic and will have better accessories. Paying attention to the quality of your paddle and pump should be secondary as you can upgrade those later. There are a few accessories you will need to pay attention to when making your purchase. Typically all SUPs come with heavy adjustable aluminum paddles. These should be collapsible for easy transport. Carbon fiber paddles are of better quality and are also much lighter in weight. Oftentimes you may not need a transport bag for your SUP, especially if you frequent waters close to where you park. If you plan to hike to your lake, you may want to focus on getting a SUP carrying bag. Typically SUPs don’t come with a PFD included but they are incredibly important to have along for your paddle. These should typically only set you back between $20 – $50. Having a paddle board leash is important, especially if traveling into rougher water such as rivers or the ocean. While SUP’s don’t require you to have a roof rack, it can be incredibly desirable if you frequently use your board. This is because you may not want to inflate and deflate your SUP when you are using it multiple times in a short period. What Are the General Stand Up Paddle Boarding Rules on the Water? Yield to bigger boats: Even though you may not consider it to be, a paddleboard is still a water vessel. This means you have to play by the rules on the water. It’s best to let anything larger than you have the right of way. Wear a PFD: You might not like the look or feel of a personal floatation device but it can save your life (and is often required when paddleboarding). Every state has different regulations that you’ll need to be familiar with before heading out on the water. When choosing your perfect paddleboard we recommend you be incredibly picky. These sought after paddle boards have dropped significantly in price as more and more products become available making it so there is no better time to buy than now. We love inflatable boards since they are easily stored in the trunk of your car which means you are able to paddle whenever the mood strikes. Consider your weight and your preferred use and then search within your comfortable price range. No matter your decision, we are confident any of these isup boards will serve you well. Reading the many iSUP reviews out there will show you just how popular and versatile these are. The convenience of having your ten foot board collapse into a backpack you can bring to work or school is incredibly desirable. Not having to strap a rigid board to the roof of your car will allow you more time on the water. The list of features doesn’t end there. From a quick five minute setup time to the unparalleled durability, these isup boards will exceed your expectations. Hard foam sup boards are susceptible to cracks, dents and chips that inflatable boards are immune to. We highly recommend you try different ways to use a stand up paddle board. More than just an afternoon leisure activity, a iSUP can take you across the lake to find great camping spots or even be the perfect platform for fishing. Looking to get fit? This is more than just a lazy day at the beach. Without knowing it you will get a great full body workout. Had a busy day at work? Try paddling to the middle of the lake for a unique perspective and a quiet place to meditate. No matter your age, people everywhere agree that paddleboarding has quickly become a favorite activity. No longer just for suburban folks, these inflatable paddle boards are great for city dweller as well as they will easily fit in an apartment and smart car. A great family outing even with the dog, floating on water does wonders for just about everyone. It can be a relaxing lounging experience or a race to the finish line. Are you an adrenaline junkie? Once you’re comfortable with your iSUP, try taking to the waves. The best inflatable SUP for surfing should include a leash and be an inflatable sup board in which you have lots of stability. All of the isup boards on this list are designed for all skill levels. If you are new to the sport these isup boards are designed to be stable and ride like a rigid foam board. This will ensure that you will learn quickly and be able to ride like a pro in no time. More advanced riders will be able to do things take their board for weekend adventures or paddle in rough conditions. 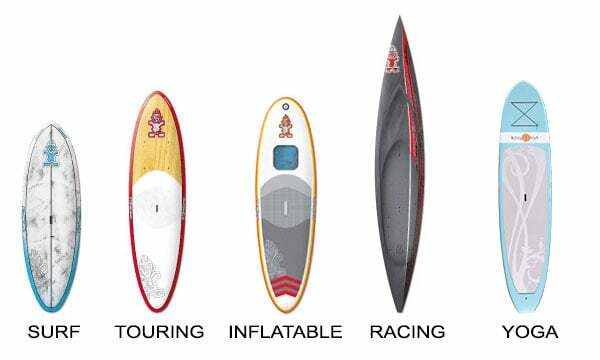 When looking for a iSUP it is important to know terminology and features of the best inflatable stand up paddleboard. Being able to understand how these details will affect your ride will help you determine which paddle board is right for you. We have put together a list of everything you need to know. Planing Hull – The all around, great at everything inflatable paddle board. Being flat and wide, these isup boards are very stable while performing great in flat or choppy water. Being easy to maneuver makes them a great sup board for beginners and experts alike. All of the paddle boards on our list fall into this category. Displacement Hull – Designed for long distance paddles and racing these sleek inflatable isup boards are designed with speed in mind. Their narrow body with a pointed frame gives them the power to cut through the water with ease. Not recommended for beginners, these are tricky to navigate and much less stable. When looking at different paddle boards it is important to check out how much weight the isup board will comfortably keep afloat. Don’t just account for your weight, but the full weight you want to put on the isup board. Want to paddle with a friend, pack a daypack, or bring your dog along for the ride? Their weight will need to be added to yours when choosing an inflatable paddle board. Short boards (9 feet and under) these are typically intended for kids because they are easy to maneuver. Medium boards (9 to 12 feet) The majority of paddleboards fall into this category being ideal length for both calm lakes and ocean riding. Long boards (12 to 14 feet) are designed for touring or racing. Coming narrow and long they may be more difficult to turn but are great for catching speed. Inflatable – We love these sup boards for their unparalleled durability and their extreme lightweight. Usually being made with a strong PVC shell, these are strong and durable boards that are easy to store. All of the paddle boards on our list fall into this category. EPS Foam – Among the lightest of the isup boards, the interior of the paddle board is foam with a fiberglass or plastic outer shell. Polyurethane Foam – Comparable to the EPS boards this paddle board weighs in heavier. Most often seen used on beginner isup boards. On the underside of your isup board, there is either one large singular fin or three smaller fins which act as a guide navigating you through the water. These little pieces of plastic allow for you to maneuver through the water with ease. They are removable to increase storage ability. Single fin – This provides more resistance in the water and are best suited for those with a powerful stroke. The best choice for a beginner as it will provide a straighter paddle, especially through choppy water. Paddles are usually sold separately except in some iSUP packages. Having an adjustable height, ensure the paddle can be 6-8 inches taller than your head. This is the optimal height for the best stroke. Leashes ensure you and your paddle board stay attached. Paddleboarding is a relatively easy sport to learn but in the beginning you may take a few dives in the water. In the ocean with a more unpredictable surf it is critical to make sure your inflatable sup board stays within arms reach. Pump: The one downfall of inflatable sup boards is your need to pump your boa*rd up with every use. A small price to pay for storage and transportation simplicity. Backpack: It may seem incredible but these 10 feet long sturdy isup boards condense small enough to fit inside a backpack. Lots of inflatable SUP come with backpacks that are the perfect size to fit your isup board. Gauge: Each inflatable sup board will have a PSI rating that you should optimally inflate your paddle board to. Having a gauge will ensure you stay within it as to not overinflate your isup board. Q: How Do I Choose An Inflatable Paddle Board? A: Choosing an Inflatable Paddle Board doesn’t have to be a hard process. You will want the best inflatable SUP board because of its portability, ease of storage and its versatility. Since it can be condensed into a small package it can be thrown in the trunk of your car, or even worn on your back in a backpack. Once you’ve decided that an inflatable SUP is right for you the next step is to figure out your use. Aspects like the length, width, and weight (including carrying capacity) all vary with different boards. There are boards for everything from yoga to racing to fishing using SUP boards. If you are looking for a great all around board look for one that is at least 6 inches thick with a weight capacity of at least 350 lbs. This will allow you to stand on the board without getting your feet wet while giving you the ability to carry gear with you. Q: How Long Will My Inflatable Paddle Board Last? A: This answer isn’t always easy to answer. The truth is, it depends on how well you care for it. SUPs are built durable, especially inflatable ones. If you rinse your paddle board after every use to get rid of any build up and store out of direct sunlight your board will last much longer. The sun is harsh and reducing the exposure will help it look sharp and keep it from warping. It is also important that you store your board safely. Due to the size of these boards, the best way to do so is to invest in a sup wall mount. You can expect your board to last many many years. You will likely look to upgrade your board and sell this one before it becomes unusable. Most SUPs come with warranties between 1-3 years long. Q: How Durable Is My Inflatable Paddle Board? A: The answer is simple: VERY durable! Inflatable paddle boards are usually made of military grade PVC. This is a material that has been designed by the military, for things like zodiac boats, that has an increased durability. Boards made from this material are usually puncture resistant which makes them great for rocky shores and hidden obstacles like tree stumps. What makes this type of PVC great is that it is still able to be folded and maintains a lightweight feel. While these boards can handle a rough beating, it is still ideal to use a SUP board bag to provide further protection. These bags also make transporting your SUP super easy. If you have to hike to your favorite beach simply throw your board into a bag and you have both hands free to hike and climb. Q: Can I Use My Foot Pump To Inflate My Paddle Board? A: Yes you can. Some boards come with a pump which has a gauge on it. If yours didn’t we strongly recommend getting a pump that has one. Every board has a different rating for how much air they can handle. This is usually around 15 PSI. You will find that when you first pumping your board will inflate effortlessly. But as you reach 12 PSI it will get harder and harder to get to that elusive 15 PSI. Without a gauge telling you your board is fully inflated you can overinflate it which can cause it to pop or seams to become weak. An underinflated board will not perform nearly as good either. It can bend in weird ways and not be responsive in ways you need it to be. Q: How Do I Clean My Inflatable Paddle Board? A: Cleaning and maintaining your SUP is important. Many people think this is only needed when taking it through salt water but it is important to do so after use in fresh water as well. There are many microbes in lakes that will cause mildew to grow on your board. A thorough rinse is all you need using the fresh water from your hose. Be sure to pay close attention to any metals on your board that are prone to rusting. This is especially important around your fins and where your leash attaches. Many people hose their board off forgetting about the other water accessories they use. Rinsing your paddle, leash and pads you use is important as well. This will allow your gear to last for much longer and allow your money to go further. Be sure to always rinse your life vest as well. This can be done with a hose or for a deeper clean you can rinse in a tub of 10 parts water to 1 part bleach. After rinsing your board allow it to fully air dry before putting into your paddle board bag. This will reduce the chance of mold growing. Limit the exposure to the sunlight by allowing your board to dry in the shade and storing out of direct sunlight. Q: How Do I Locate A Leak In My Paddle Board? A: Your paddle board is large and locating a small leak can be challenging. Running your hand over to feel air blowing works. If this doesn’t work, a better way is to fill your SUP with some air and then put it below the water and look for bubbles. As these are designed to float be sure not to fully inflate and hold specific sections below the surface so you can easily locate the leak. Q: How Can I Patch My Inflatable Stand Up Paddle Board? A: Most iSUPs come with a patch kit that will give you everything you need to repair your board. A patch as well as a stick of heavy duty glue help to ensure that your board rides like new again after patching. Simply place the patch over the hole and thoroughly secure it with the marine grade glue provided. Q: What PSI Do I Inflate My Paddle Board To? A: Every board will have a different recommended PSI. Most boards will be around 15 but can vary depending on their size and width. Be sure to not overinflate your board as it can cause havoc on the seals and seams. We love when our exercise is more fun than tedious. Paddling is much like escaping to the mountains for the weekend, a great experience for your mind and body. Breathe the fresh air and paddle to the middle of the lake with confidence. You can go where you’ve never been before with the help of these paddle boards. The isup boards on our list will ensure your weekend trip is full of fun. These inflatable stand up paddle boards will be the life of the party. All of the inflatable sup boards are made of durable PVC material and are stable and rigid when fully inflated. The feeling of walking on water will be hard to get used to in the beginning so kneeling to start is often a great idea. The beauty of having the best inflatable SUP is that you can bring it with you anywhere. Having the best inflatable sup board is not just great for storage but will prove much more useful as you can stuff it into your luggage and bring it just about anywhere. Have one the best inflatable paddle boards on our list? Let us know how you like it in the comments below.